No idea how you would flash it or connect it to the computer but I’m sure y’all are smarter than me when it comes to that lol. I would just enjoy if it surprised us and just worked no one here st all has a v1 black cartridge come on!! That would be a huge breakthrough for the users wanting to use 3rd party resins. Hopefully FL doesn’t mind too much lol. I really think they would sell more products if prices were a bit more reasonable and not like 3rd party cheap, but somewhat. Actually, Formlabs could get ahead of the game and start offering the sale of empty cartridges for third party use chipped to our request and make a profit. Does this line/crack/seam/etc. occur if you press the continue immediately? Or, is it only a problem after sitting for some time, and then coming back and pressing continue? 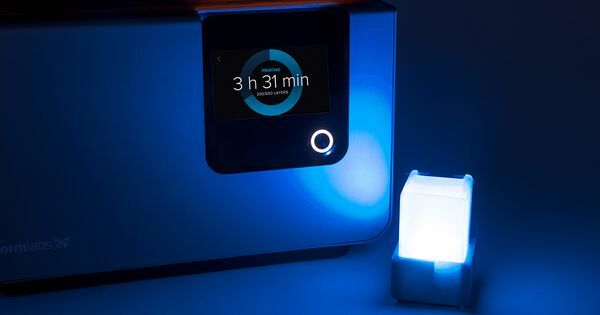 Formlabs engineers developed a pocket-sized Form 2 that communicates printer status with LEDs, and plays a celebratory song once a print finishes. If the dashboard throws a specific message when it needs that 100mL button press, then theoretically you could make a little hack to have it link to the button presser and your set. You would still need to pour resin in if in open mode. Which is what it looks like has to be done since older cartridges are nowhere to be found. That being said, you would have to babysit the prints. Is there a “short list” of compatible resins that actually work and are available in Europe ? If it’s not encrypted it shouldn’t be too difficult(just building a simple controller to communicate to the PC). If I have some time I’ll try it this week. A dollar says this is encrypted. I opened up a few cartridges, it’s a non-encrypted chip(just checked the datasheet). I expect that reflashing this thing will be a breeze. Now, I only need a black V1 cartridge and make an adapter to reflash tanks. First going to try to make a black cartridge behave like a tough cartridge. The ability to reset the cartridges along with replacing bite valves would be a huge advantage for the third party resins. The chip hardware may not be encrypted but the file on the chip likely is. It’s not going to be a big file so you might be able to compare a bunch of tags to decipher the settings. I swear I’m not trying to be a Debbie Downer here, but what happens if FL stops having Black V1 as a print option? I’m guessing that’s gotta be just an update away? Also, @fantasy2 that would be SO freaking sweet if you could start flashing cartridges… PLEASE keep us posted!! If they stop support, then we’ll have to be creative and find another solution. Or just never update the firmware inside the machine. You’ll be the first to get a flashing device when it works. Victory shall be ours!? This would be wonderful for my Applylabworks resin testing. I can read the data from multiple cartridges. I can erase them and write new data in them. However…(there it comes). You cannot copy the data from one cartridge to another cartridge. The F2 will stop recognizing the cartridge. So there must be some kind of hash or checksum in the data comparing the chip ID. I have not checked which bytes change after printing. After writing the original data back in the chip, it is again fully functional. So mayyybe it is still possible to save the data of a fresh cartridge and then every time it’s empty, just restore the initial data. This can probably be checked by reading how much resin is in the cartridge according to the F2(you can get this data by sniffing the LAN network), printing something, flash data back and check again. …and then it could be that the F2 stores the chip ID into his own memory once it’s empty. Manufacturers like stratasys do something similar. After writing the original data back in the chip, it is again fully functional. So mayyybe it is still possible to save the data of a fresh tank and then every time it’s empty, just restore the initial data. This can probably be checked by reading how much resin is in the tank according to the F2(you can get this data by sniffing the LAN network), printing something, flash data back and check again. Hmmm… Are you saying that once the cartridge is empty, the system will no longer recognize it (or remember it as empty), even if you refill it with the same resin? I’ve heard of many people that simply refill the cartridge and it keeps working (at least until the valve gives up). You can keep refilling cartridges, but at some point the system will refuse to continue printing(read somewhere it’s around 2+ liters). Stratasys for example records levels in their cartridges and as soon as the cartridge is empty, it records it’s chip IC inside the machine. So for now it seems to be possible to get the data from a new cartridge, store it and once the cartridge is empty, reflash the chip and put new resin in. The data seems to be two separate hex strings. If there is an error in the first string, the F2 will wipe it but keeps the second string so I guess that’s the checksum part? I checked the code and milliliters before starting a print and after the print. You could see a difference in milliliters. Then I reflashed the memory and now my tank shows the original milliliters used! Any genius wanna help to dig more? I don’t see a difference in the second hex number? Are you referring to “79EDBC06”?